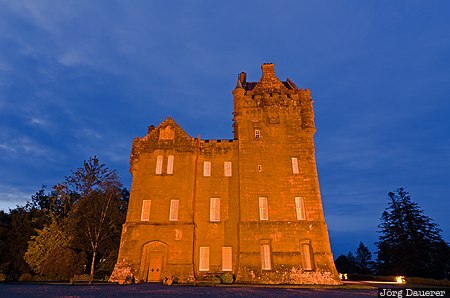 The flood-lit facade of Brodick Castle seen at the blue hour just after sunset. Brodick on the Isle of Arran in the south of Scotland, United Kingdom. This photo was taken in the evening of a cloudy day in June of 2013. This photo was taken with a digital camera.